A crew uses a bulldozer to build a detention pond underneath the I-610/US 290 interchange. Work on this project is substantially complete. With the roadway work substantially complete, one of the final tasks left for the contractor is to build detention ponds underneath the I-610/US 290 interchange. These ponds ultimately will hold water during rain events. Westbound W. 18th motorists cross the I-610 West Loop northbound frontage road. The contractor opened W. 18th underneath I-610 this past month. In the middle of this picture is the direct connector from I-10, which opened this month in its final configuration. Two lanes go to I-610 eastbound, and two lanes go to US 290 outbound. US 290 and I-610. (left) This is how that area appears from the ground. 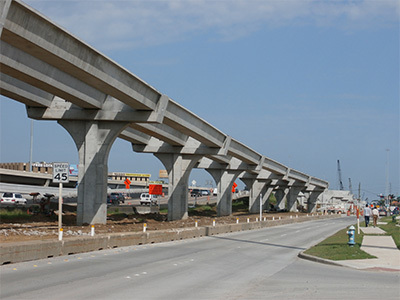 (right) TxDOT anticipates this construction to be completed in August 2018, at which time this direct connector will be in its final configuration. The contractor is continuing work on the I-610 northbound and southbound U-turns at W. 18th. Once completed, these will provide motorists with U-turns at W. 18th for the first time. The contractor continues to shape the soil under the I-610/US 290 interchange connector ramps. Ultimately detention ponds will be constructed in these areas. The contractor has begun pouring concrete for the I-610 West Loop north- and southbound U-turn lanes at W. 18th, they are shown in pink on this picture. Crews have begun grading operations for the detention ponds at the I-610/US 290 interchange. The yellow line marks where the contractor has placed concrete to provide a separation between the I-610 northbound frontage road on the right, and the Minimax Drive access on the left. Highlighted in yellow is the ramp connecting I-10 to US 290, which is currently shared with vehicles to the right of that ramp traveling from I-610. Once the US 290 outbound mainlanes are completed, this ramp will only serve motorists traveling from I-10. I-610 northbound motorists travel through the W. 18th intersection. This intersection is one of the few remaining items left to complete on this project. In the middle of this picture is the direct connector taking I-10 motorists to US 290 outbound and I-610 eastbound. To the right I-610 northbound motorists are using it to access US 290 outbound as well, that will continue until the US 290 outbound mainlanes are completed in late 2018. Shown at bottom left is the intersection of the I-610 northbound frontage road and W. 18th Street. The contractor is progressing toward finishing the I-610/US 290 interchange, and this intersection will be one of the last portions of this project to be completed. In the middle is the direct connector ramp from I-10 to US 290 and I-610. Just to the right of the connector is a concrete stub which will ultimately take I-10 motorists to US 290. I-610 northbound motorists below the stub are currently using that space, but ultimately will have their own exit to US 290. Construction in this area is anticipated to be completed by late 2018. A new U-turn will be constructed on the I-610 West Loop northbound frontage road at W. 18th. The new direct connector from I-10 is in the middle of the picture, near the bottom is where the new direct connector merges into the I-610 eastbound mainlanes. Stormwater detention ponds will be built in the area below the direct connector. This month the contractor opened the new direct connector from I-10 to US 290 westbound and I-610 eastbound, which is in the middle of the picture. This allows I-10 motorists to avoid having to travel on I-610 northbound, reducing weaving movements on that roadway. At left, motorists use the new I-610 northbound frontage road overpass. To the right of the frontage road is the direct connector from I-10 to I-610 eastbound and US 290, which is anticipated to open in May 2017. The road on the left is the new I-610 West Loop northbound frontage road over Hempstead Road, which opened at the end of March 2017. To the right of that, is the future direct connector from I-10 to I-610/US 290. On the left shows the future I-610 northbound frontage road. On the right is the future I-10 direct connector to I-610 North Loop. In the middle, motorists exit from I-610 northbound to US 290 westbound by using what will ultimately be the direct connector from I-10. 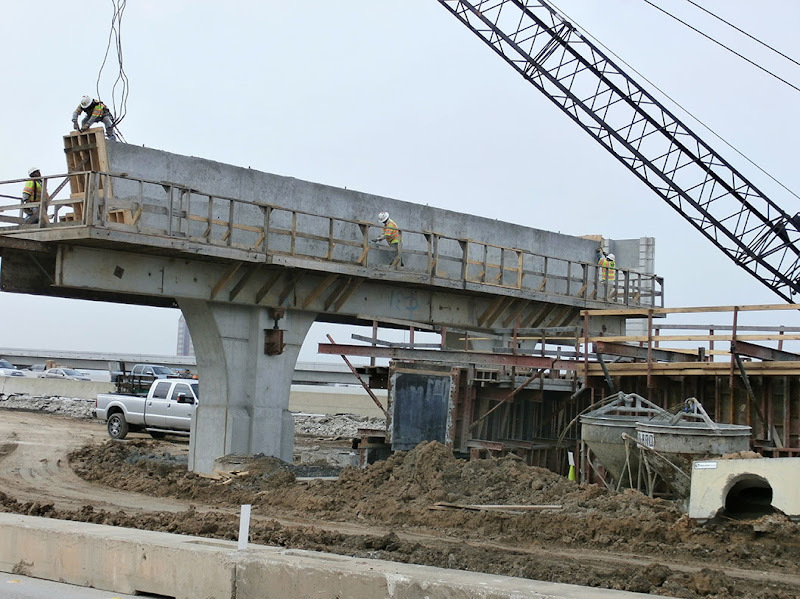 On the left side of the photo, bridge beams have been placed on the future I-10 connector ramp to I-610 eastbound. On the left side of the photo, crews continue to work on the future I-610 West Loop northbound frontage road. The contractor has placed beams and poured the concrete decking over Hempstead Road. To the right is the future direct connector from I-10 to US 290 westbound and I-610 eastbound. At left in the image are beams the contractor recently placed. They will support the exit ramp from the I-10 direct connector to the I-610 North Loop eastbound. 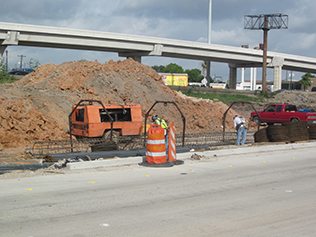 The contractor works on the steel rebar for a new exit on the I-10 to US 290/I-610 direct connector. This exit will let motorists coming from I-10 eastbound and westbound exit to Minimax Drive, W. 18th Street, or use a new U-turn at W. 18th to get to Hempstead Road. The contractor works to clear space for the new I-610 northbound frontage road near Minimax Drive. 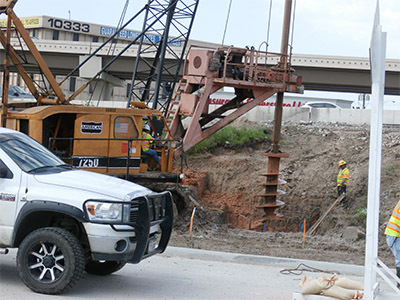 The contractor works on columns just north of Hempstead Road for the new direct connector from I-10 to US 290, and the new continuous I-610 northbound frontage road over the Union Pacific Railroad (UPRR) tracks. (left) Crews build a temporary ramp from I-610 northbound to the direct connector from I-10. 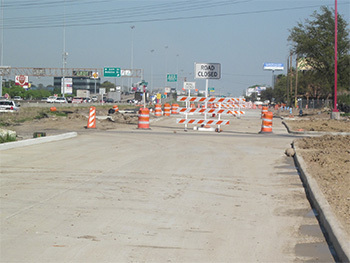 (right) This will provide motorists a new way to access US 290 westbound , while creating space for the contractor to work on the US 290 westbound mainlanes near I-610. 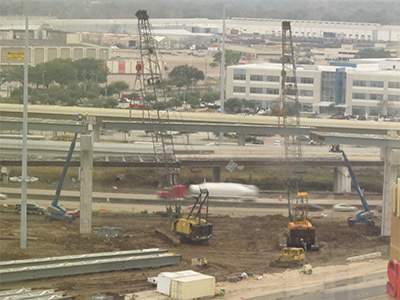 The contractor works on bridge foundations for the new direct connector from I-10 to US 290 and I-610 (left). Bridge work is progressing on that new direct connector (right). 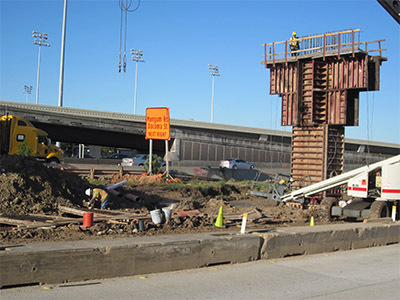 The contractor builds columns between Hempstead Road and W. 18th Street for the new direct connector from I-10 to US 290 and I-610 (left and right). From Old Katy Road to Hempstead Road, most of the columns for this direct connector have been constructed. An excavator removes some of the old northbound I-610 pavement just before W. 18th Street to make room for the future I-10 to I-10 North Loop/US 290 connector. Columns for that direct connector have been constructed between Old Katy Road and Hempstead Road (right). These pictures show you progress on the new direct connector from I-10 to US 290 and I-610. 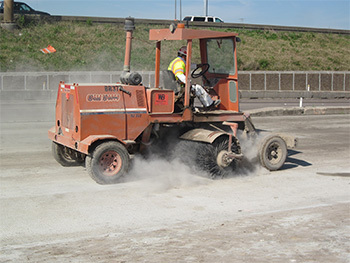 On the left, the contractor clears the area near I-610 and Hempstead Road where a portion of the direct connector will be built. On the right, the contractor works to finish the pavement for the direct connector near outbound US 290 and Dacoma Street. In the middle of this picture you can see northbound I-610 motorists driving on new pavement, as the contractor made the traffic switch in early November. To the left of that, you can see the old northbound I-610 pavement. That pavement will be removed to make space for the new direct connector from I-10 to US 290 and I-610. 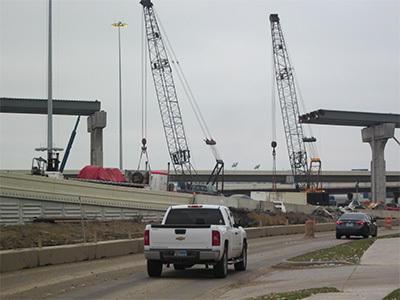 On the left you can see crews building columns near W. 12th Street for the new direct connector from I-10 to US 290 and I-610. At right, the contractor works on the other end of that direct connector near Mangum Road. Once completed, this roadway will allow I-10 motorists the opportunity to access westbound US 290 and eastbound I-610 without having to travel on the northbound I-610 West Loop. Near the middle of the picture at left, you can see work occurring on the new northbound/eastbound I-610 mainlanes. 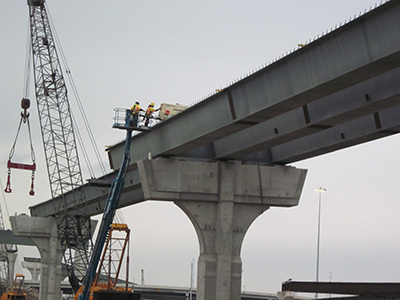 The image on the right shows a closer shot of crews building those new I-610 mainlanes. 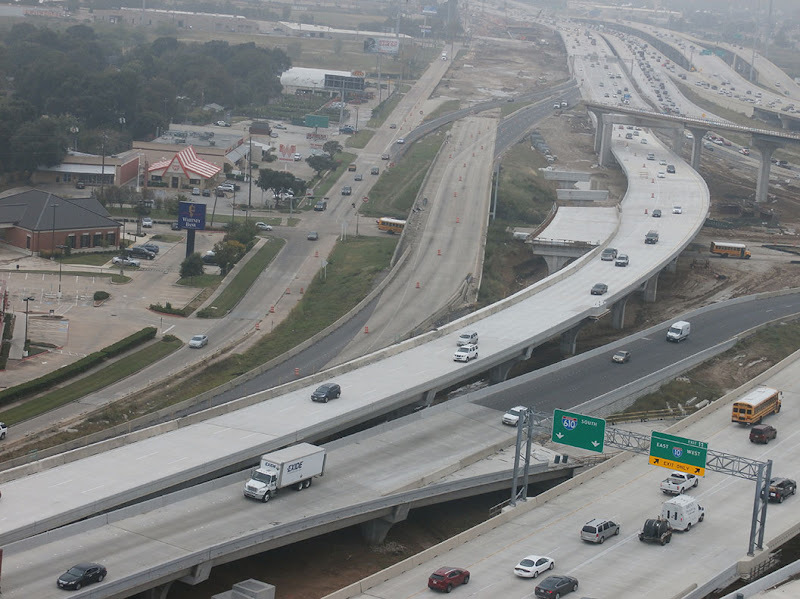 The picture at left shows an aerial view of the I-610/US 290 interchange, looking north. 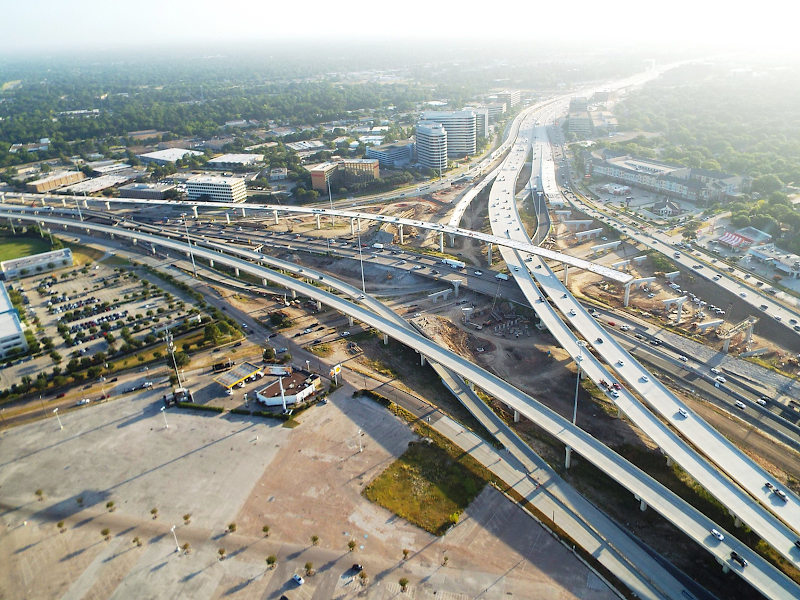 The long elevated ramp at the bottom is the direct connector from US 290 to I-10, completed as part of Project K. Near the center of the picture you can see another long elevated ramp, which is a portion of the direct connector from I-10 to US 290, being built as part of Project J-1. In the middle of the picture on the right, vehicles drive on new I-610 West Loop northbound pavement, to which they were switched this month. The area just to the left of those vehicles is where the contractor will build the rest of the direct connector from I-10. The picture at left shows an asphalt area in which crews are constructing the new northbound I-610 mainlanes. At right, the contractor builds columns for those lanes as they turn eastbound. Once the northbound/eastbound I-610 mainlanes are completed, motorists will be moved onto them. In the vacated space, the contractor will build the new direct connector coming from I-10 to US 290. These pictures show the contractor working just east of Mangum Road, on the new direct connector from I-10 to outbound US 290. In this picture, the contractor works to install storm sewer along the inbound US 290 frontage road just east of Mason Road. After that work is done, crews will build the new frontage road on top. 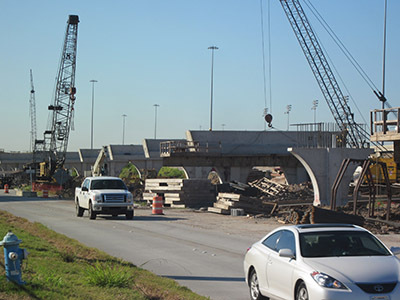 The image at left shows a space for beams for the new direct connector from I-10 to US 290. On the right, you can see cranes lifting one of those beams into place. 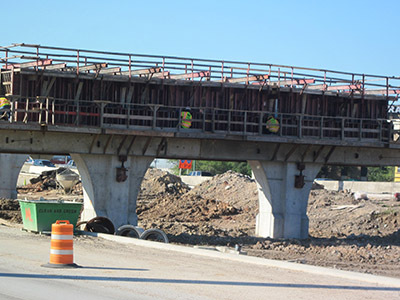 By the end of March 2015, beams for this direct connector had been hung from the I-610 interchange to Dacoma Street. 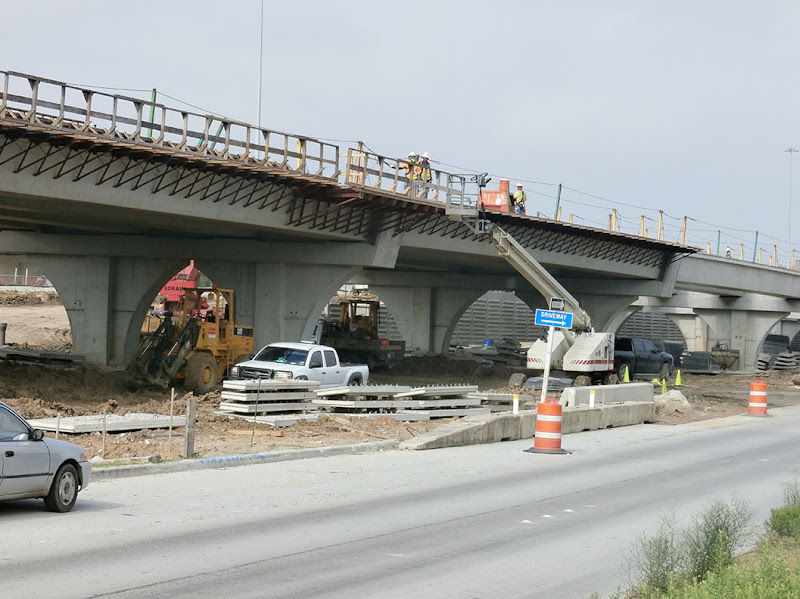 Crews hung several beams this past month for the new direct connector from I-10 to outbound US 290, and the picture on the left shows some of those beams near US 290 and Dacoma. On the right are columns just west of there, which will have beams hung on them soon. From left to right, the first two pictures show crews installing storm sewer along US 290 westbound near Dacoma Street, in the same area where they are constructing the new direct connector from I-10 to US 290 westbound. The picture at far right shows progress made on connector columns closer to Dacoma. 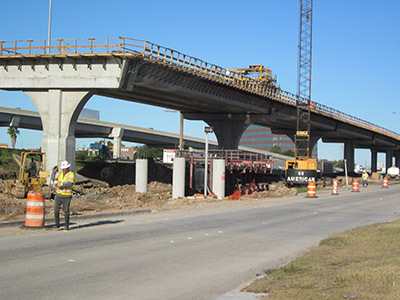 At left, crews work on building columns near Dacoma Street for the new direct connector taking I-10 motorists to outbound US 290. A portion of that ramp near Mangum Road appears on the right, with beams hung on some of the columns. This ramp is anticipated to be completed in late 2016. 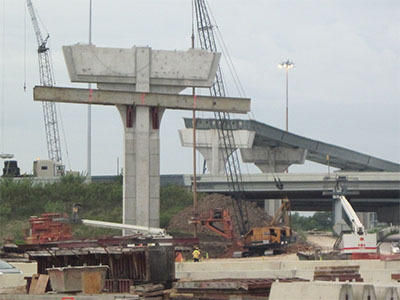 In the foreground of the picture at left, crews build a column at the I-610/US 290 interchange for the new direct connector ramp from I-10 to westbound US 290. This column will eventually connect to the columns you see in the background. 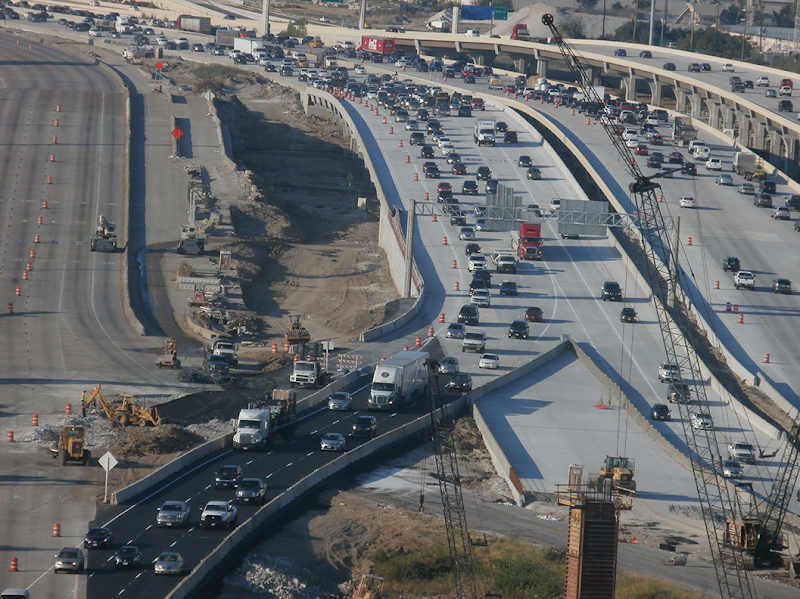 At right is what work on that direct connector ramp looks like along westbound US 290 near Mangum Road. 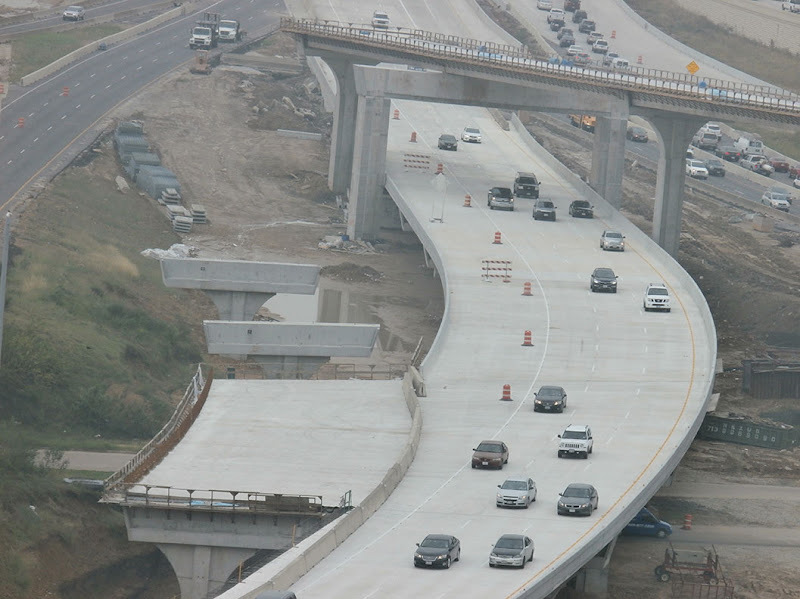 The new ramp will merge into US 290 just before W. 34th Street, and is anticipated to be completed by late 2016. 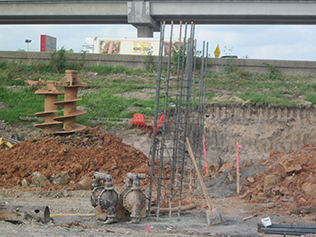 The picture on the left shows crews building a circle of steel rebar near US 290 and Mangum Road, which will be used to support columns for the new direct connector taking I-10 motorists to US 290. On the right is a shot of column rebar already in place. That new direct connector is being built where the outbound US 290 frontage road used to be located. Here the contractor puts finishing touches on the outbound US 290 frontage road just before W. 34th Street. 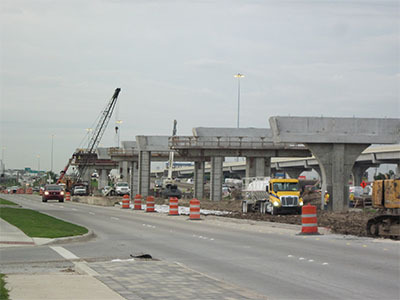 That frontage road, from the I-610 interchange to W. 34th, was opened to traffic in April 2014.